This CellML model runs in both OpenCell and COR to recreate the published results. The units have been checked and are consistent. ABSTRACT: Intracellular calcium oscillations, which are oscillatory changes of cytosolic calcium concentration in response to agonist stimulation, are experimentally well observed in various living cells. Simple calcium oscillations represent the most common pattern and many mathematical models have been published to describe this type of oscillation. On the other hand, relatively few theoretical studies have been proposed to give an explanation of complex intracellular calcium oscillations, such as bursting and chaos. In this paper, we develop a new possible mechanism for complex calcium oscillations based on the interplay between three calcium stores in the cell: the endoplasmic reticulum (ER), mitochondria and cytosolic proteins. The majority ( approximately 80%) of calcium released from the ER is first very quickly sequestered by mitochondria. 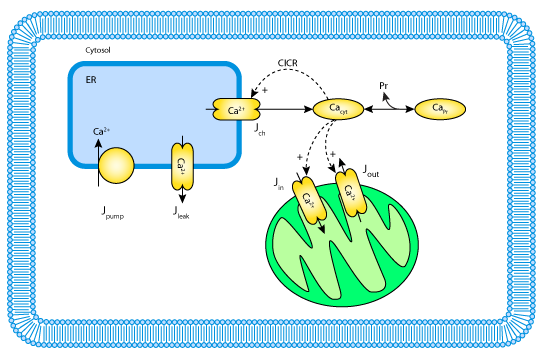 Afterwards, a much slower release of calcium from the mitochondria serves as the calcium supply for the intermediate calcium exchanges between the ER and the cytosolic proteins causing bursting calcium oscillations. Depending on the permeability of the ER channels and on the kinetic properties of calcium binding to the cytosolic proteins, different patterns of complex calcium oscillations appear. With our model, we are able to explain simple calcium oscillations, bursting and chaos. Chaos is also observed for calcium oscillations in the bursting mode. Schematic diagram of the model sysytem. Derived from workspace Marhl, Haberichter, Brumen, Heinrich, 2000 at changeset d6ab3e5316c3.